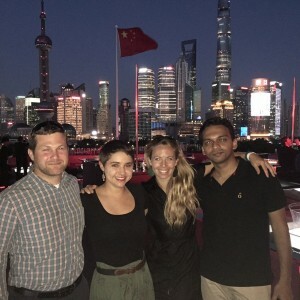 Having studied international relations and lived abroad for a number of years, I’ve experienced first hand the interconnectivity of our current world. One of the reasons I chose the Oregon MBA is because this program also understands the importance globalization has on business. 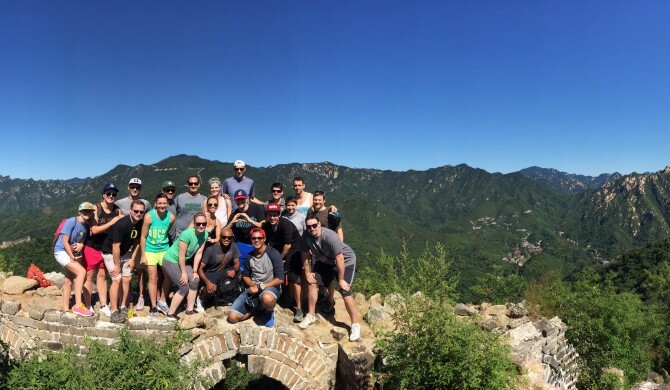 The Oregon MBA takes it one step further by offering all students a highly subsidized international business trip to Asia to experience international business first hand. Woetzel). What does this mean for international businesses looking for growth? You’d better establish a presence now and start building a relationship with this powerful market. 2) Young consumers: Asian consumers are significantly younger than their Western counterparts. Chinese born after 1980 represent more than 50% of the Chinese population, and Indian’s median age is only 27. These young people have grown up in a connected world, are more receptive to Western ideas and businesses, and deeply aspire for a better life (Helen H. Wang). They pose a huge opportunity, but are also a difficult segment due to their ability to detect manipulations and false intentions. That’s why authentic brands are crucial. 3) The importance of authenticity: Asian consumers are getting savvy to fake offerings and poor imitations and now that they have the financial ability, they want the real thing from brands that recognize traditional differences and cultures. What this means for new businessmen and women is that it is going to become vital to have someone on the ground who really understands what the Asian consumer is looking for and his or her pain points. It is also a huge opportunity for people with strong people and relationship building skills if they are willing to live and work internationally. 4) The increased awareness of health and happiness in place of money as a symbol of status: Chinese citizens have realized that a higher income doesn’t always have the expected correlation with well-being, thus recent trends have shifted. The increased importance on happiness and welfare as measurements of success has led Chinese citizens to be more physically active, more relationship and community focused, and care more about the state of the environment. 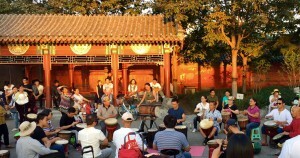 Average Chinese citizens are sick of pollution and the illnesses it causes and are demanding more from the government. Chai Jing, for example, became a sensation with over one million YouTube views of her documentary Under the Dome Investigating China’s Smog. However, Chai Jing doesn’t claim to be an extreme environmentalist; she’s just a normal citizen bringing light to the questions that all Chinese have begun asking. She’s just a mom who wants a healthier life for her daughter, as do all Chinese citizens. Corporate social responsibility and sustainability will be vital to the success of businesses operating in Asia. The statement above stems from Native American wisdom and is the inspiration behind the Nike N7 collection. For those that have not heard about the Nike N7-partnered event run through the Warsaw Sports Business Club at the University of Oregon’s Lundquist College of Business, read up. 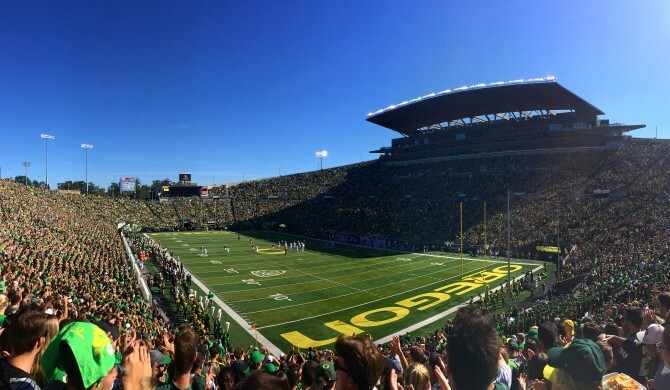 Very exciting things are happening with a vision started only three years ago by Jesse Schwarz, former Duck and Warsaw Sports Business Club executive. 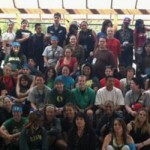 The UO-Nike N7 Youth Movement is heading into its fourth year—with a larger staff whose hours of hard work will cumulate in a field day event held for Native American and at-risk youth to promote a healthy lifestyle and a sense of community through sport and rich Native culture. 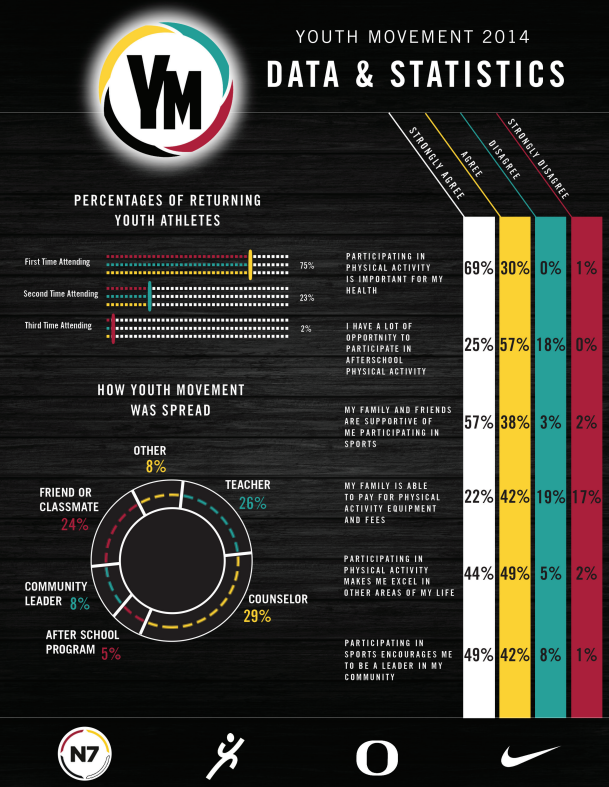 This past term has been a blast for the Youth Movement staff because the event has started gaining some real traction within the Oregon community. Throughout the first three years of the event, the essence and direction was still taking form. But this year, the vision is clear and by leveraging countless social media platforms, the movement is spreading like never before. The University of Oklahoma and Oklahoma State University have committed to the Youth Movement vision and will be pioneering their own events for years to come. The University of Oklahoma is going into their second year of hosting a field day and Oklahoma State University will be hosting their event for the first time. 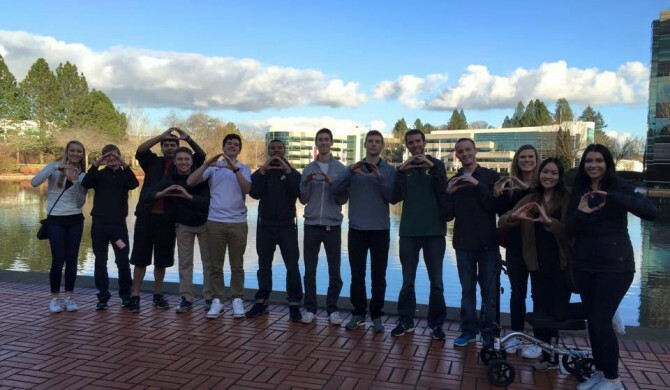 The UO staff recently held our official visit at the Nike World Headquarters in Beaverton, Oregon. During our time there, we were fortunate enough to present to Sam McCracken, the visionary and chairman behind Nike N7, about the future of the event. Later, we toured the Nike campus with Schwarz, who is now a digital producer at Nike, and ended the day by picking up some N7 gear from the employee store. 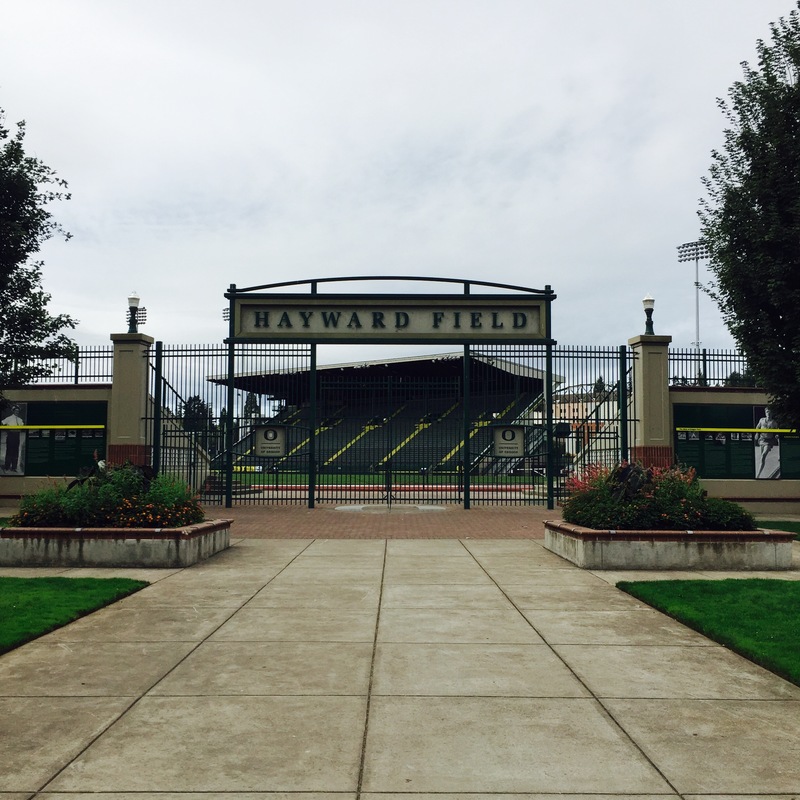 This year’s field day will take place on April 17 at the Moshofsky Center on the University of Oregon campus in Eugene. This venue will give participants the opportunity to spend time on a real college campus, which can make a lasting impact going forward. There will be countless hours of new projects worked on in the next couple months leading up to the event. The staff is excited. The schools and organizations involved are excited. And Native Americans everywhere can be excited because this is truly a movement to be proud of. 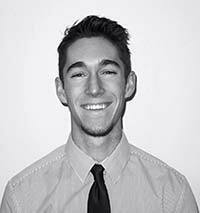 Mitch Feingold is a business administration major who is minoring in Spanish. He is also a member of the Warsaw Sports Business Club. Design is a business and business is a design. To acknowledge this relationship is to understand the power of branding. 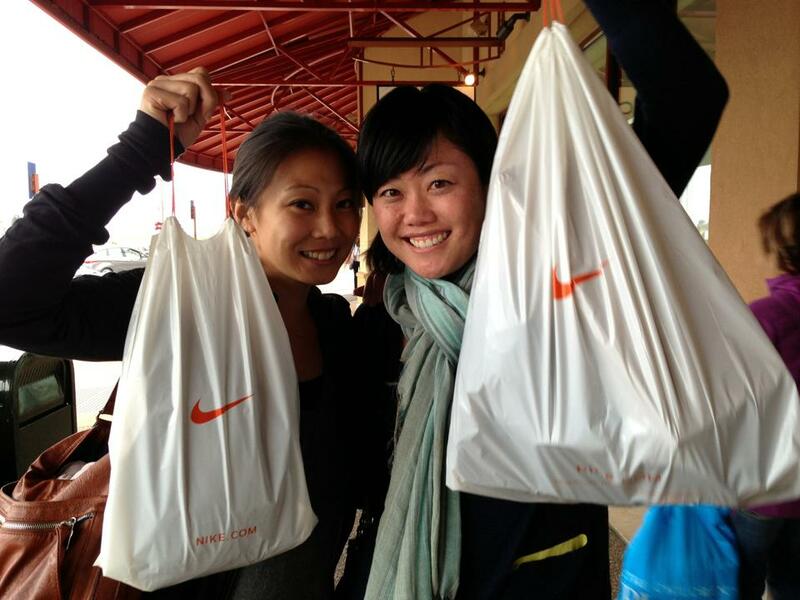 Nike, first and foremost, knows the power of brand innovation and capitalizes on this strength. And the University of Oregon has adopted their branding expertise. The school and it’s programs have become a national brand, thanks largely in part to the man behind the curtain, the creative genius who is the powerhouse for Nike creative, Tinker Hatfield. As we sit in a conference room overlooking Eugene in the fall, a sunset compliments the dramatic air in the room. Thirty-five, University of Oregon Sports Marketing MBA’s wait patiently for an informal sit-down with one of the most respected University alums. Tinker Hatfield walks in relaxed, cool and casual. There is a lot to respect about someone as talented and as well known as Tinker, even if you may not be familiar with the creative design process. However, in my world, he is someone I have studied and revered throughout my career. 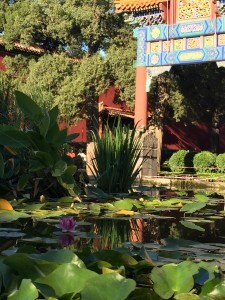 I came into this MBA program with a background in design and marketing. My undergrad degree is in graphic design but I always knew that I wanted a more dynamic career. I laid out a plan; work as a designer-gather as much experience as possible, then diversify. Get the business degree. Because, if there is anything I have learned about working for businesses as a designer, there is nothing more valuable then the communication between the business and the person/team who designs how your business is perceived in the outside world. Some people I spoke to understood my thinking, others didn’t, but then listening to Tinker address 35 MBA’s about the importance of understanding business and communication, I was validated. Among the stories and his background he illustrated a point of advice that I think will resonate with all of us as we begin to design our post-grad careers. He said, being great at one thing is good but being good at several things is your strongest asset. He told us to use our skill diversification as a competitive advantage. There is nothing more valuable than understanding the communication between different functions in the business. Coming from someone who has defined the importance of the creative innovation process and the effects that it has on a business empire, this advice is something that is irreplaceable. To all business professionals and those working towards their goals, remember to continue to learn and change in your surroundings and always design your own future. 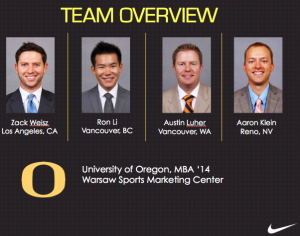 2nd year Warsaw Sports Marketing MBA. Building a career in strategic planning with a passion for creative business development. 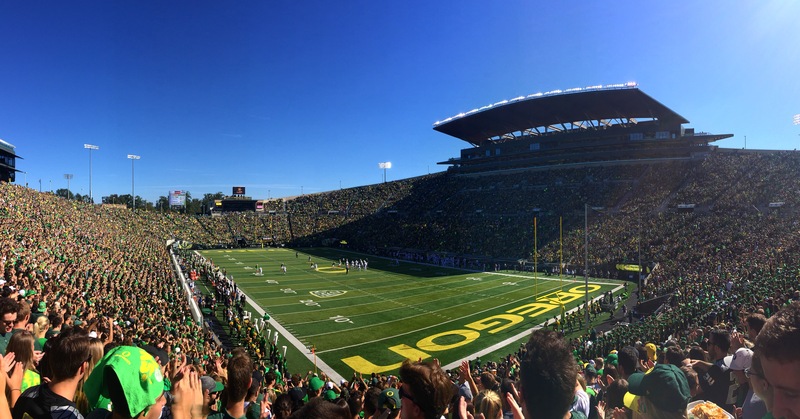 The following post was written by Mitzi (Ing) Yonezawa, WSMC Class of 2013, and provides a recap of her experience in the Oregon MBA program. Is it strange to say that I always knew I’d attend the University of Oregon? Since high school, I have wanted to attend UO. It took seventeen different countries, eleven years, three jobs, two GMAT exams, and one failed attempt at professional softball to bring me to Oregon, but I made it. Sports initially led me away from Oregon, but eventually also managed to bring me back. After six years of international relations experience in Japan, I decided to follow my passion and work in Major League Baseball. I decided that I needed to go back to school and earn my MBA. 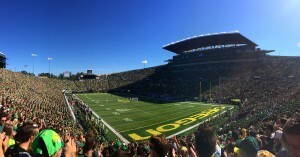 The only MBA program for sports business I applied to was the Oregon MBA. I saw the Warsaw Sports Marketing Center’s program as the best route to working in professional baseball and decided that if I didn’t get in, I would try again the following year. It was all or nothing. I interviewed via Skype from Japan with then-GTF Kelsey Philpott (’11) and Managing Director Paul Swangard, (neither of whom knew that I interviewed in athletic shorts and a suit jacket). I never took a campus tour or met with current students in person, I just knew that it was where I wanted to be. I put all my eggs into the Warsaw basket and thankfully, it was the right decision. 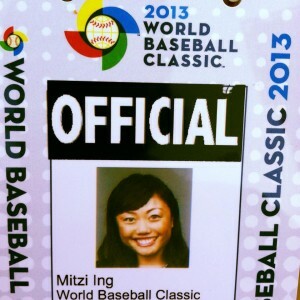 I had two main goals when I started the program: 1) work for a MLB team and 2) work at the World Baseball Classic (WBC). While they seemed lofty at first, I was able to achieve both goals through hard work, persistence, and networking. Yes, the dreaded networking. The sports industry, as with business in general, is all about who you know. I always made sure to follow through on introductions, send thank you notes, ask for a project or shadowing opportunity, and always say YES because each experience will be a learning one. Most importantly, I was always genuine and appreciative. 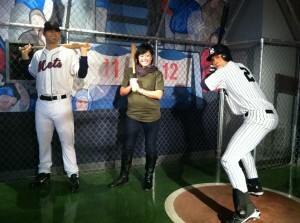 The first project for the WBC in creating a social media strategy helped me land an internship with the New York Mets. 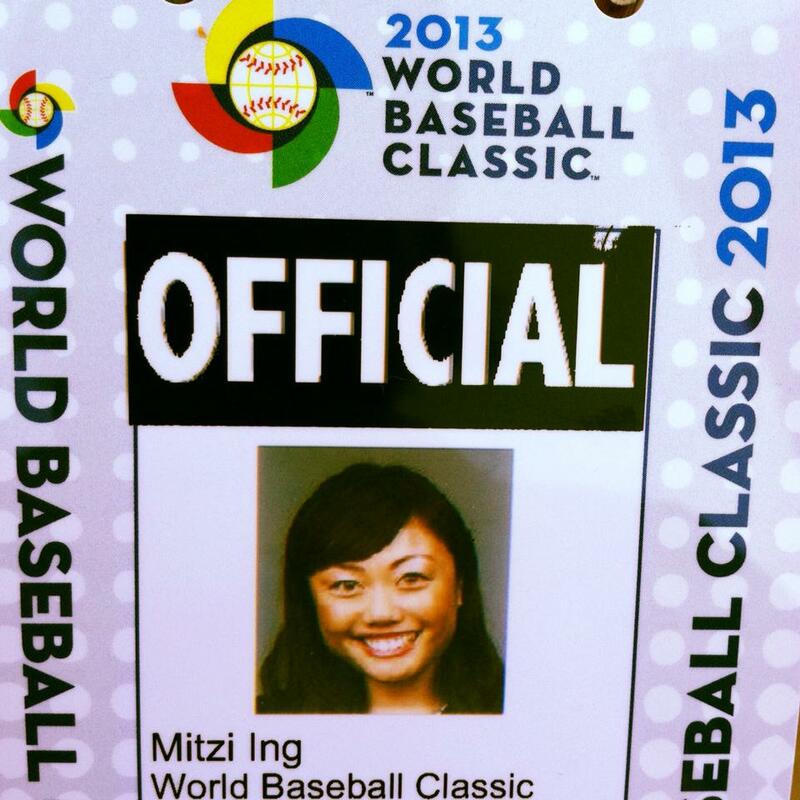 My Mets experience helped me get a PR role at the WBC at the first, second and championship rounds of the tournament. My involvement with Movember, work for the UO Athletic Department’s Quack Cave, attendance to conferences hosted by espnW, the International Olympic Committee, the Giving Back Fund, and the MLB Winter Meetings, social media management for the documentary “We Grew Wings” and participation in numerous intramurals filled up my schedule outside of class. All of these opportunities gave me invaluable experience in social media usage and analysis, brand management, marketing, and PR as well as and chances to develop my business soft skills. I came to the OMBA wanting to impact people through sport and thought I would do so through community relations or PR in MLB. Ellen Devlin, my mentor and friend (the best kind of teacher!) 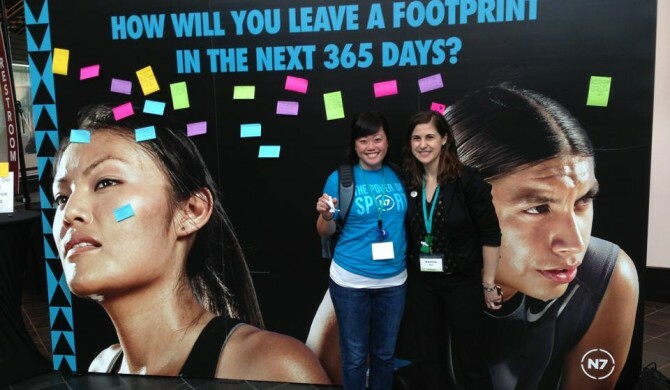 made me realize that NIKE was a company where I could affect change and make an impact. 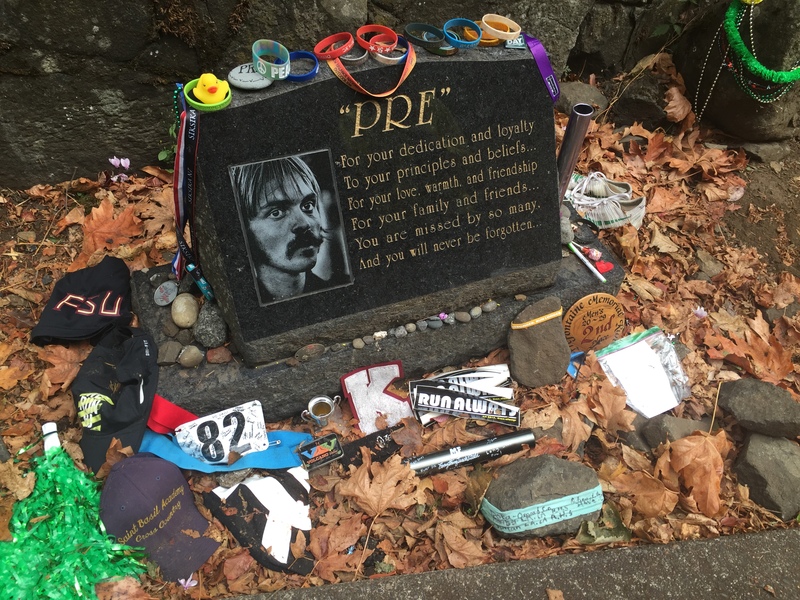 Through her initial introduction to a friend, I learned about how NIKE is looking to change the game of baseball through servicing the athletes with premium and innovative product. Long story short, through informational interviews, side research projects and spending time on campus, I was inspired by the company. My education, international work experience, personal and professional contacts, athletic background, and passion formed the right combination the NIKE Baseball team was looking for in a team member to help take the category to a new level. I had found my career path and a new home in Oregon. 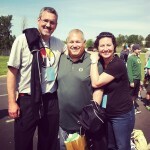 The best part about the Oregon MBA? The people, by far. I truly believe that none of my accomplishments during my time in the program would have been possible without its motivational professors, hardworking staff, and my talented classmates, whom I call friends. Thank you to everyone, especially my husband, family, and friends. Look out world, here I come! Mahalo nui loa and Aloha! In the Warsaw Sports Marketing Center, MBA students enjoy many opportunities to gain industry experience as student consultants for prominent sports properties. 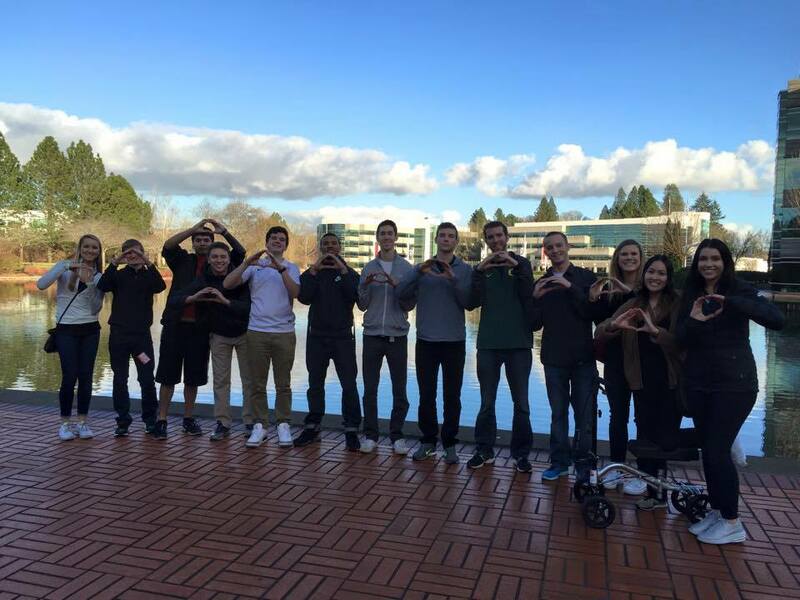 In this post, Aaron Klein (MBA ’14) recaps an opportunity to present digital merchandising research at Nike Inc.’s headquarters in Beaverton, OR. 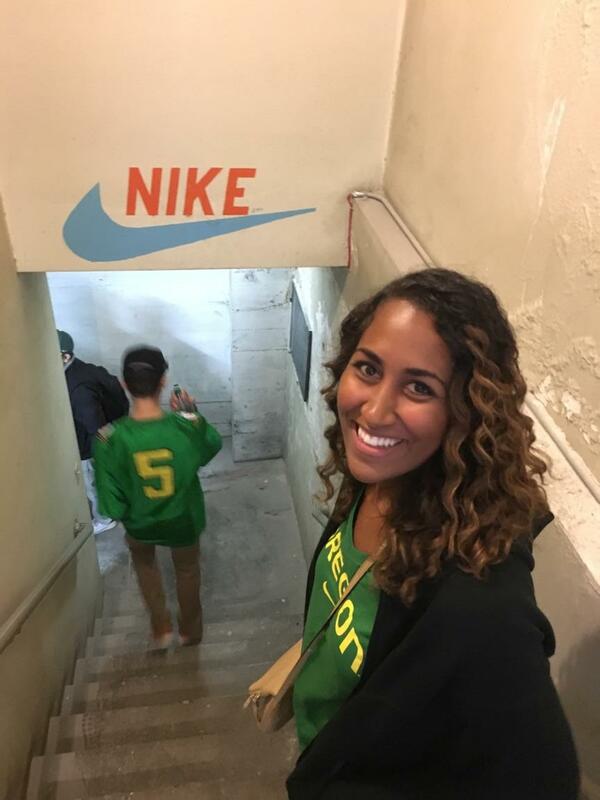 For our Marketing Sports Properties class project we worked with a Warsaw Alum, Merryn Roberts-Huntley, from FIXX Consulting on a project for Nike. 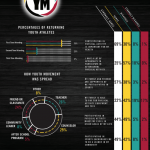 Specifically, we worked with Nike’s Wholesale.com country teams to analyze the digital merchandising of their global accounts. We spent about three weeks on the project doing research in the digital merchandising arena and coming up with proposals for best practices and recommendations for the accounts. 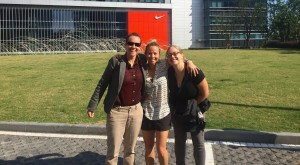 At the end of the three weeks, our group got the opportunity to present our findings to Nike. As a follow up to our initial research, our group was tasked with researching consumer behavior as it relates to shopping on mobile devices. We spent another 2 weeks doing this research and again presented our findings to Nike’s Wholesale.com country teams. The experience was second to none. ; researching a real problem and presenting our recommendations to a real client was an amazing experience. 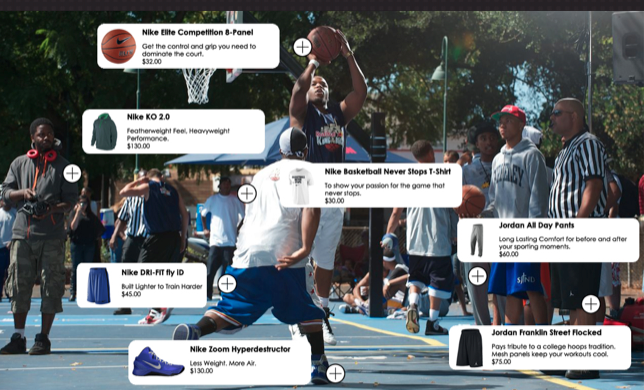 The most rewarding thing for me was to find out that our recommendations were actually being put to use and would be shared with Nike’s Wholesale.com accounts. Our group definitely took a lot away from this project, and added a nice piece to our resumes. Dan is a member of Oregon MBA Class of 2014 concentrating his studies within the Warsaw Sports Marketing Center. Naya’s mission is to enhance the diverse strengths of our youth and families in partnership with the community through cultural identity and education. 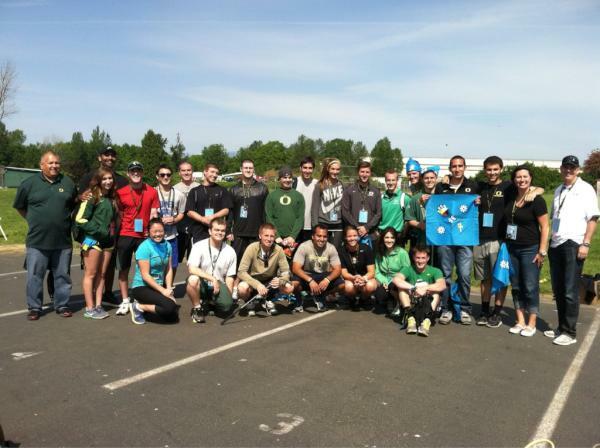 WARSAW worked with nearly one hundred high school students during the Nike N7 field day. Throughout the day, students were able to participate in a number of American sports ranging from football and basketball to lacrosse and golf. There were also a few Native American games the students were able to play, such as: shinny and hot rocks. Anthony Newman, a Duck Alum and past NFL player was able to spend all day with the kids inspiring them to work harder and understand the importance of a team. At the end of the day two students (one female and one male) were chosen for the spirit award. Attributes had to consist of, cheering on their teammates, never giving up and taking on a leadership role when needed. The students were not aware of this award and yet, a handful were strong contenders when it came time to choose. When the day was completed and the students had gone home, teachers at NAYA made sure Nike N7 and the WARSAW Sports Business students knew the impact they just had. The teachers expressed how a handful of students who participated in the field day had never participated in physical activity before. They assured us we were not only inspirational to the students but eye opening as well. WARSAW along with Nike N7, was able to create a day were students wanted to come to school and work together with their classmates. All in all, it was an inspiring experience that the WARSAW Sports Marketing students will never be able to forget.